Who doesn’t love bacon? Right? Now combine bacon with one of my favorite blogger contests – the Saucy Mama Blogger Contest – and I couldn’t wait to get started. First comes the hard part of choosing products to sample since they all sound so good. 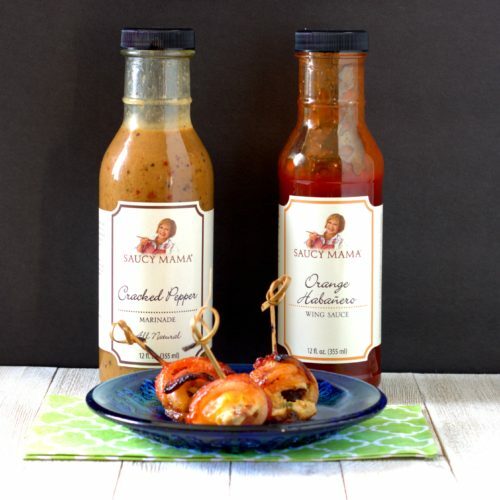 From the variety of mustards, sauces, and marinades I finally narrowed it down to the Saucy Mama® orange habanero wing sauce and Saucy Mama® cracked pepper marinade to work into my dish. 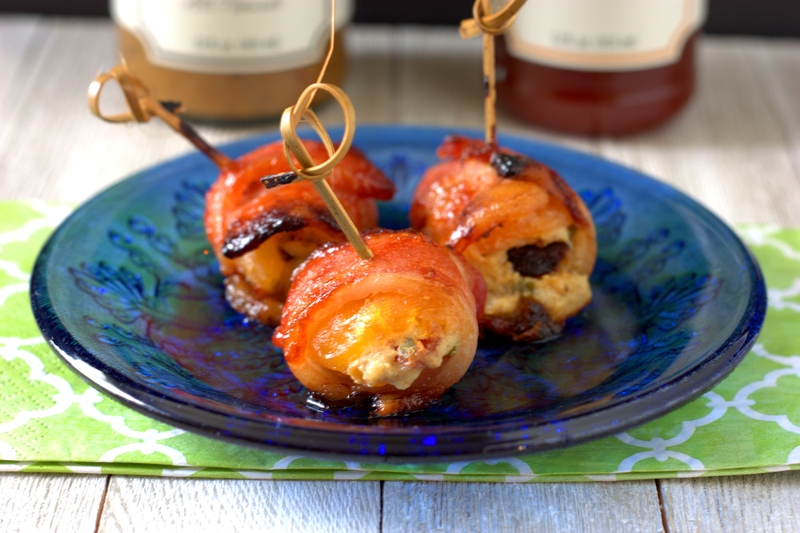 My entry for this year’s contest is a blend of one of my favorite appetizers (bacon wrapped blue cheese stuffed dates) and Turkish apricots to create Saucy Bacon Wrapped Stuffed Apricots. I mixed the Saucy Mama® cracked pepper marinade (and a bit of green onions and bacon) into some ricotta cheese for a well spiced, creamy stuffing. Once stuffed and wrapped with bacon, the apricots got a coating of Saucy Mama® orange habanero wing sauce for a sweet kick. The Saucy Bacon Wrapped Stuffed Apricots are baked until the bacon is crisp, and the wing sauce has caramelized. My family loved them so much I don’t know if I could make enough for a party since they fly off the plate so fast. Give them a try and see what I mean! Pre-heat the oven to 375 °F. Place 2 pieces of bacon in a 12-inch skillet. Pan fry the bacon over medium heat, turning occasionally, for 8-10 minutes or until crisp; cool and crumble. Mix ricotta cheese, green onion, crumbled bacon, and Saucy Mama® cracked pepper marinade, stirring to combine. 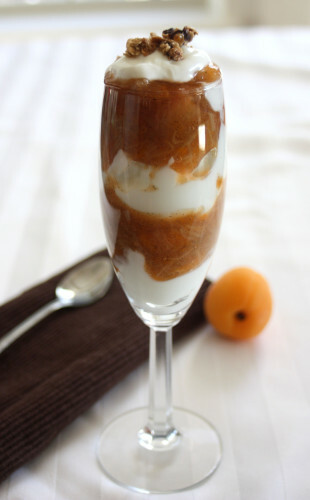 Gently pull open the cavity in the dried apricots and place ~1 teaspoon of ricotta in the center of each (i.e. 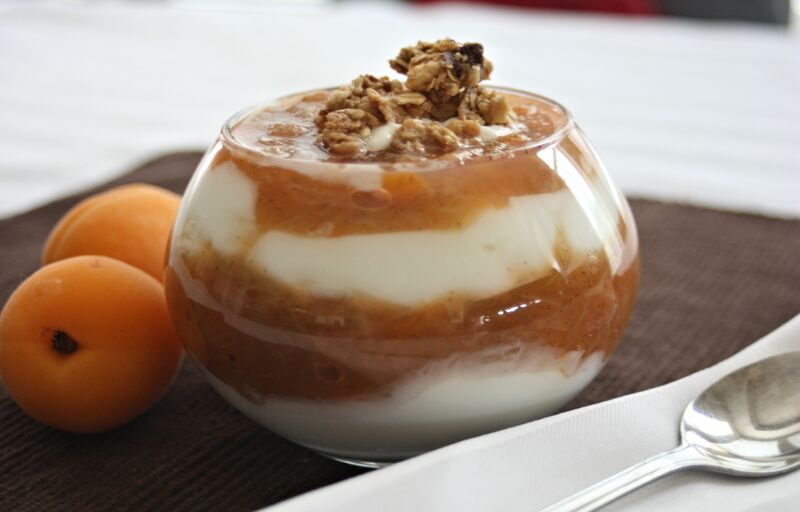 equally divide the ricotta mixture between the apricots). Cut the remaining bacon slices in half, wrap one around each apricot, and secure with a toothpick. Place on a large baking sheet (13 inches x 18 inches), and evenly brush the tops of the wrapped apricots with the Saucy Mama® orange habanero wing sauce. Bake for 40-45 minutes or until bacon is crispy. Remove from the oven, cool slightly, and serve. What is one of the best ways to sneak an extra serving of vegetables in at breakfast or dessert? Pretend the vegetable is a fruit! 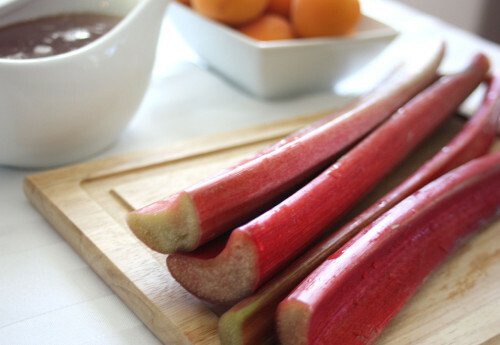 Rhubarb is actually a vegetable, despite its famous use in strawberry-rhubarb pie. It is also delicious in savory dishes, but one of my favorite ways to eat it is in compote form, which is just a fancy way of saying a sauce you can use like a jam or finishing syrup. 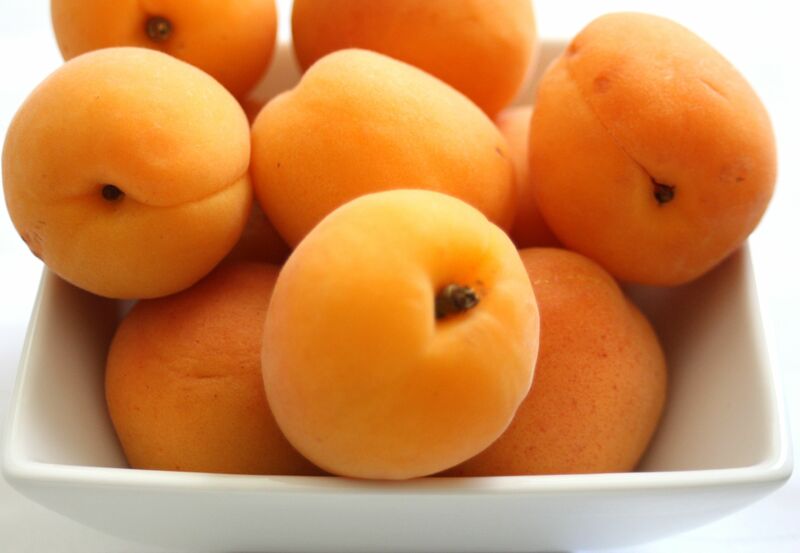 Then I chopped a few fresh apricot, adding sweetness, color, and great flavor to the mix. The fruit, along with honey, water and a vanilla bean were all added to a large pot and simmered together for a few minutes. The vanilla adds a lovely undertone, but if you don’t have any handy, this compote will still be scrumptious if you skip it – I promise. 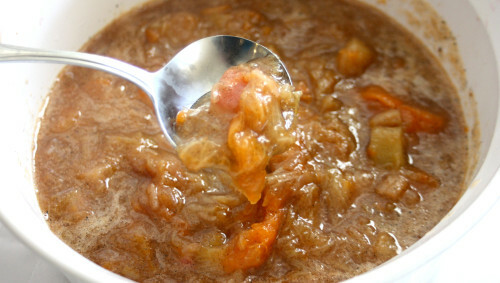 The end result is a sweet-tart, delicious mixture that is the consistency of thick applesauce. Once it cooled, I layered it generously with some Greek style vanilla yogurt and topped it off with my favorite granola. This has been a great way to start my day this week, and soo easy to put together. It even did double duty as dessert one night! 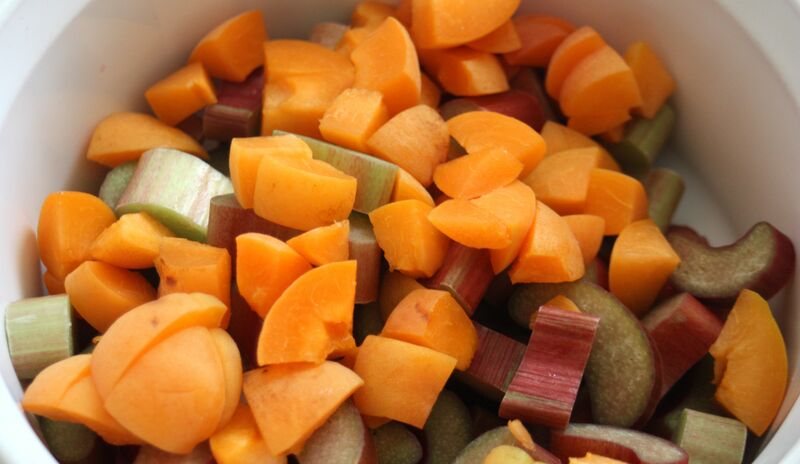 Add the rhubarb, apricots, honey and water to a large pot. Scrape the seeds out of the center of the vanilla bean, and add both the seeds and the pod to the pot. Place the pot over medium heat and bring to a boil, then reduce the heat and simmer for another 15-20 minutes or until the rhubarb has started to soften. Remove from the heat, remove the vanilla pod from the pot, and let the rhubarb mixture cool. Store in an airtight container in the refrigerator until ready to use. Makes ~2.5 cups of compote. To make the parfait, layer equal amounts of the Rhubarb & Apricot Compote and Greek style vanilla flavored yogurt in a glass. Garnish with granola and serve. Makes 5 parfaits.